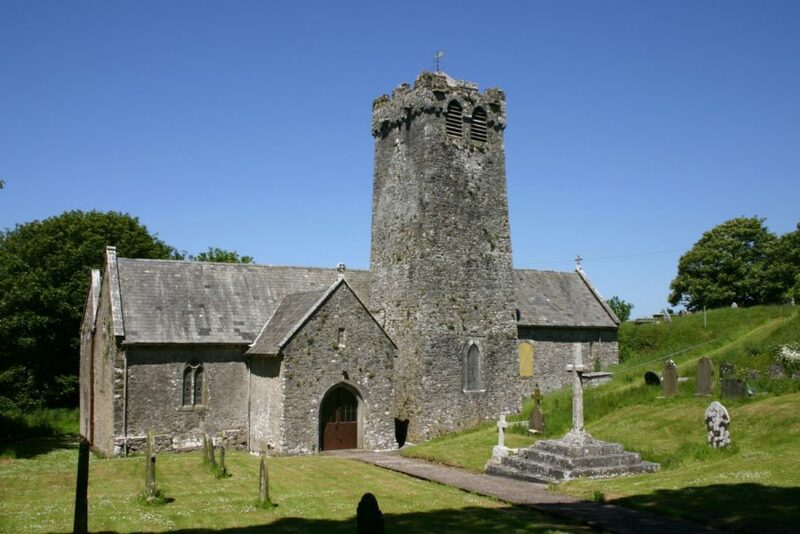 Despite the availability of level sites nearby, the church at Castlemartin is cut in to a steeply sloping rock bank outside the town centre. Perhaps the proximity to a stream and two wells, gave this site spiritual significance or perhaps, “nestled in a sheltered, tree-lined hollow” it offered invisibility from marauders coming from the sea. The site is encircled by earth-banked encampments, possibly prehistoric, an ancient burial mound and an Anglo-Saxon chapel, while several early pilgrim paths lead to and from the church. The church can be traced, architecturally, to the late 12th, early 13th century, when the parish enjoyed wealth and status due the abundance of fertile, lime-rich soil favourable for crop farming. The scalloped font and arcade to the north aisle are the oldest visible remains of the original church. The small carved faces on arcades are described in the listing as having “a death-like appearance, with closed eyes and shrunken noses and lips.” It is interesting to note that these masks face north – traditionally the dark or ‘devil’s side’ of the church and are therefore figures of protection. The 15th and 16th centuries brought much change to the church: the north and south chapels were removed, as was the north transept. The tower, which was originally steeply roofed with gables to west and east (verge lines of which are plainly visible as a seam in the masonry), was heightened by two further vaulted stages. Pre-Restoration sketches also indicate the presence of a west porch of Jacobean character of such size than it more resembled a chapel. John Campbell, 2nd Earl of Cawdor, commissioned David Brandon to restore the church in the late 1850s. At this time the church was re-roofed, re-floored and re-fenestrated, the vestry was added, and the doorways rebuilt. As a legacy, encaustic tiles emblazoned with the Cawdor arms decorate the chancel floor. The east window is by Heaton, Butler and Bayne and depicts the Ascension. This was presented by the parishioners in memory of Lt. Col. Francis and Lady Victoria Lambton, whose family lived at Brownslade Farm. Lady Victoria was Queen Victoria’s god-daughter and a rendering of Balmoral Castle is included in the window. The window in the slype, which connects the aisle to the chancel, depicts St Michael, the church’s patron saint. This romantic rendering of the saint, dated to about 1900, is believed to have also been the work of Heaton Butler and Bayne. The south transept is filled with memorials to the Lambton family and contains a window by Hardman to a design now known to have been by Pugin depicting the Crucifixion. It has been described as the best example of a Pugin window in any Welsh church and is now the sole survivor of the five that Hardman made for the church in the early 1850s. Church normally open daily 9-5pm. Closed weekdays in winter. Vestry and tower are kept locked as bat maternity roost under observation by ecologist.